Launching our monthly folk concert series at the New Room, we welcome Methera – contemporary traditional music from a ground-breaking quartet. Cafe open from 6.30pm, doors 7pm, concert starts 7.30pm. Unreserved seating. Adult £12. Concessions £10 (Over 65s / Student / Unemployed). Tickets available in the New Room cafe and shop, or on Eventbrite (online booking fee applies). 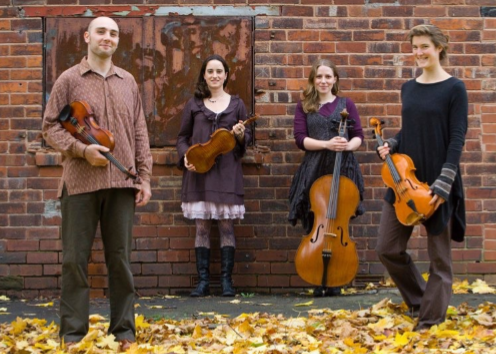 Methera is a unique ensemble: a string quartet with roots firmly planted in English traditional music. Their national tours, BBC Radio 3 broadcasts and collaborations have helped them establish a reputation as a scintillating live act, blazing a trail through the uncharted territory that lies between folk and chamber music. Lucy Deakin (cello), John Dipper and Emma Reid (fiddles) and Miranda Rutter (viola) combine a deep knowledge of traditional music with a wide range of other influences and expertise and a deep sense of musical interaction. Newly composed pieces sit alongside timeless traditional material; their music is both sophisticated and earthy, groundbreaking and familiar, enchanting and thrilling – chamber folk at its best.